Preheat oven to 375 degrees. Open your pumpkin up with a knife (along the top of course if you’re making a jack-o-lantern) and pull out all the seeds. I usually do this with my hands, then use a big spoon to scrape the last of the seeds out, along with the stringy guts. Separate any pumpkin pulp from the seeds. Very small pieces of pulp in the seeds are fine. 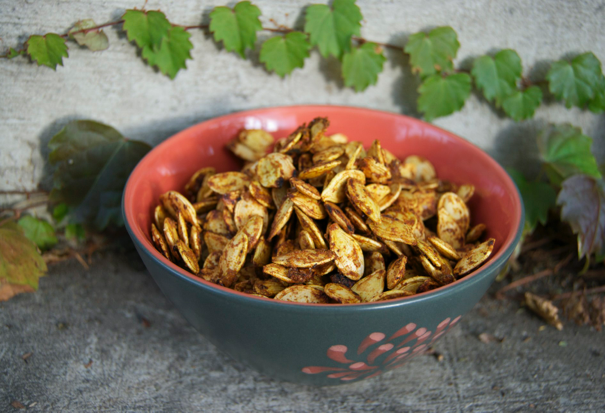 Do not rinse the seeds as they will have more flavor with the pumpkin juice on them. Combine the seeds and all the remaining ingredients in a bowl, stirring to combine. Pour seeds on to a sheet pan lined with a silpat or parchment paper. Bake for 30 minutes, stirring half way through. Turn the oven off and leave the pan in the oven until it is cool enough to remove with your bare hands. This will continue to dehydrate the seeds making the shells and interior seeds dry and crunchy. These are great as snacks and salad toppers.